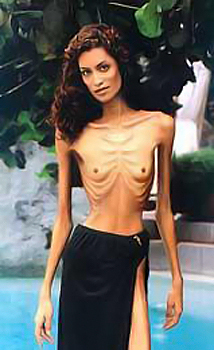 Anorexic models victims to extreme diet – Awesome! 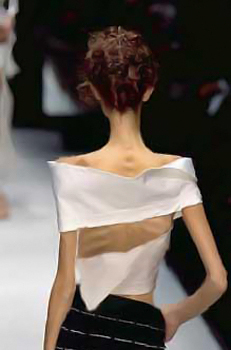 Anorexia is considered to be a professional disease of many catwalk models. It leads to depression, weakness and to much more serious health problems. The amount of death cases caused by anorexia continues to grow. A teenage model whose sister starved herself to death has also died of suspected anorexia. Eliana Ramos, 18, collapsed six months after her sister Luisel had a heart attack during a fashion show and triggered an international debate over the use of size zero models on the catwalks. Fashion bosses in Madrid and Milan have set a minimum body mass index for girls appearing in their shows in an effort to discourage starvation diets and eating disorders. This entry was posted on Saturday, February 24th, 2007 at 1:06 pm	and is filed under Advice and Guide, Blogroll, Interesting Stuff. You can leave a response, or trackback from your own site. 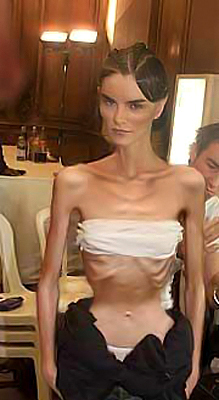 9 Responses to "Anorexic models victims to extreme diet – Awesome!" this is discusting! im doing gcse art and basing my project on how designers making there models look like this! its horrible and not healthy! 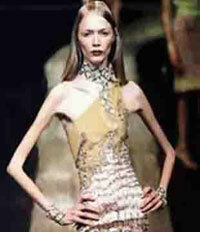 why would you want to look like this! Your photos look like they’ve been edited on photoshop… if they were really that thin, they would’ve been be dead ages ago.. I understand the comments, but everyday of my life is focused on how i could look like these thin, beautiful women. It is my desire, but if you are happy how you look, then don’t change. these “girls” are disgusting!!!! how and why could they think that it looks good 2 b that horribly skinny no one likes or wants to see their bones and organs! SORT IT OUT!!!!! I love this “look”. Unfortunately, all of the above photos, except the last one, have been photoshopped (I know, because I have copies most of the orginals from fashion sites). Whatever happened to Bony Pink? ALL of these photos are Photoshopped. FYI – there are some very strange and backwards responses on here. Somebody needs to send Sally Struthers to feed those skinny little twits. Any girl that can unlock my car door with her finger needs to get her head examined STAT! Also, FYI the crackhead that said the pics were altered and provided a bogus site to expose “truth” should take a class in art design. Doctoring (photoshopping) a black and white photo is a lot easier than a color picture….duh.